Dwelling in the warmer areas of the Pacific and the Atlantic Ocean is the not so friendly amberjack, often referred to simply as AJ. Though the fish is referred to by its singular name of amberjack, there is a multitude of different amberjack types roaming the seas, such as the greater amberjacks swimming in the Atlantic to the lesser amberjacks, banded rudderfish. Yellowtail, and the Almaco jack. As the name of the fish implies, the greater amberjacks are the largest of the various amberjack types. They can be identified by their dark stripes extending from the nose to the dorsal fins and no physical presence of scutes. These fish can weigh as much as forty pounds and tend to spend their time close to rocky reefs or not far from debris. The lesser amberjacks are the smaller of the types, yet the eyes are proportionately larger and the bodies are deeper than the greater amberjack. 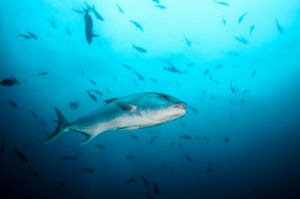 You can spot lesser amberjack by looking for an olive-green to brownish-black color and silver sides. Even though they weigh under ten pounds, these amberjacks are known for their fierce predatory skills, usually feeding on crustaceans, squid, and other fish. For fishing aficionados, amberjacks have earned a reputation for being able to put up a formidable fight. In fact, untrained anglers tend to end up with broken lines when they try and catch one of these aggressive sea dwellers. This update is by Free Spool Sport Fishing, a custom built 43’ Sports Fisherman Free Spool at Haulover Marina offering an exciting deep sea fishing experience for anyone including families, friends or business associates. Spearheaded by Miami native Captain Dennis Forgione. We fish for many different species of fish and we specialize in kite fishing for sailfish and mahi, live bait fishing for kingfish and other game fish. For more information on sport fishing Miami or to book a trip, please call 305-582-5445.